How well do you know Ivypool? 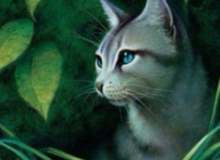 This quiz is about a cat from the series, Warriors, by Erin Hunter. The cat this quiz is about is called Ivypool. She is a main character in the Warriors series. This quiz will be testing your knowledge about Ivypool. After taking it, your results will show you how well you know Ivypool. So, take this quiz, and find out, how well do you know Ivypool? What Clan is Ivypool in? She doesnt have a mate, mouse-brain. How many apprentices did Ivypool train? What series is Ivypool first mentioned? Quiz topic: How well do I know Ivypool?